The Hobbit: An Unexpected Journey (to avoid confusion, I’ll refer to the film as “An Unexpected Journey” and the book simply as “The Hobbit” from here on in) has just been released on DVD here in the UK, which has given me reason to reflect on the successes and failures of the film. Before I start, I want to point out that overall I think it’s fair to say that I enjoyed An Unexpected Journey. However, in many respects I was also very disappointed, and I think one of the main disappointments I felt is best articulated by means of a comparison between Tolkien’s Bilbo in The Hobbit and Jackson’s Bilbo in An Unexpected Journey. Safe to say, the comparison isn’t particularly favourable to Jackson’s latest film. Overall, bracketing the additions made by Jackson, the film was fairly faithful to the book. However, probably the most disappointing and inexplicable changes were a series of more-or-less minor alterations to Bilbo’s character that cumulatively made a big (and negative) difference to his overall motivation and character progression. In the books, a key theme is the interplay between the Took and the Baggins side of Bilbo’s character. The quiet, slightly-priggish, parochial Baggins side predominates for the first few chapters of the book, but as the story progresses, it is eventually ousted by his intrepid Took side, and he learns to love the excitement of adventure. This character progression is both familiar and fairly simple—befitting of a story aimed at children—but nonetheless rewarding, as fables in which a character finds his inner courage (that was, of course, really there all along!) often are, irrespective of the age of the audience. What is fascinating about The Hobbit, and one of the things that makes it rewarding enough to warrant the devotion it rightly receives, is the subtle interplay of these two elements throughout the novel; the way the character progression is effected by the mutual reinforcement of the two aspects of Bilbo’s character, the way the tensions and contradictions within Bilbo’s character are resolved and the way these resolutions help to drive the plot forward convincingly. For example, it is largely thanks to his distinctly English, late-Victorian-style politeness, obsession with social decorum, and high concern for the opinions of others that he is swept up on his journey in the first place. The starting point for the whole mess occurs as a result of Bilbo accidentally inviting Gandalf into his house for tea, following the etiquette-challenging exchange that introduces us to the latter of these two characters. Just as Bilbo doesn’t really mean to ask for Gandalf’s pardon when he (repeatedly) says “I beg your pardon!”, he also doesn’t really mean to ask Gandalf to tea when he does, and immediately regrets doing so. This, as with most of the first interchange between the two characters, is a result of a flustered Bilbo resorting to polite platitudes in the face of someone who actively flouts Shire etiquette. Here is Bilbo at his most Baggins-ish. Significantly, though it is only thanks to the assertiveness of Bilbo’s Took side that he has the courage to challenge the Dwarves, it is Bilbo’s concern with his dignity, and his attempt to save face, that prompts the outburst in the first place. Without his Baggins side, he would have had no wounded pride; without his Tookish side, he would have simply suffered in silence at the insult. As it stands, the two aspects of his character reinforce each other, making for a satisfying motivation for his agreement to come on the adventure, albeit one that his Baggins side often rues in the hard times to come. In the movie, however, the line about looking like a grocer is transplanted into the mouth of Thorin as the start of a manufactured tension between the two characters, and Bilbo remains meekly silent in response. In fact, right up until the point at which he signs the contract and runs off to join the dwarves, Jackson’s Bilbo shows almost no intention whatsoever to join them on their journey. By eradicating the contradictions in Bilbo’s character, removing the interplay between Bilbo the Baggins and Bilbo the Took, we have no satisfying motivation for Bilbo’s decision to join the party in their journey. The only indication Jackson provides as to why Bilbo decides to join the Dwarves is provided by Bilbo’s unexpected disappointment when he wakes up in the morning to find an empty house. To the end of his days Bilbo could never remember how he found himself outside, without a hat, a walking-stick or any money, or anything he usually took when he went out… running as fast as his furry feet could carry him down the lane, past the great Mill, across The Water, and then on for a mile or more. In context, it’s clear to us, the reader, how Bilbo ended up this way. Out of Tookish pride, he agreed to join the party, and then when Gandalf arrives the following morning and presses him to go meet them, though his Tookishness has subsided, his Bagginsish demeanour leaves him too flustered and polite to refuse. Jackson seems to take this paragraph as an invitation to have Bilbo consistently refuse to join the Dwarves for the first hour of the film, only to unfathomably change his mind at the last moment. Similarly, aside from the role that it plays in explaining Bilbo’s initial motivation, the Took/Baggins distinction plays an important role in pushing the plot forward for at least the first half of the novel. Up until Bilbo’s Tookish side has completely taken over, the principal motivation for Bilbo’s continuance is his stubbornness and desire to prove himself. Furthermore, there are a few specific instances where this desire is the explicit motivation for some action. He had read of a good many things he had never seen or done. He was very much alarmed, as well as disgusted; he wished himself a hundred miles away, and yet-and yet somehow he could not go straight back to Thorin and Company empty-handed. So he stood and hesitated in the shadows. Of the various burglarious proceedings he had heard of picking the trolls’ pockets seemed the least difficult, so at last he crept behind a tree just behind William. This decision, of course, ultimately leads to Bilbo’s capture by the trolls, and the amusing mess that ensues. Jackson, on the other hand, not having this line of explanation available to him, has to change the scene accordingly. In An Unexpected Journey, instead of mutton, the trolls have taken the party’s horses, and since Bilbo can’t untie them, he reaches for a knife attached to one of the troll’s belts, leading to his capture, where the scene more or less continues on as it does in the book. Aside from the fact that this motivation isn’t as interesting or compelling as the charming picture of a proud Hobbit risking life and limb just to try and prove his (nonexistent) burglary skills to his new friends, it also makes no sense. In Jackson’s version, the trolls capture the horses, which are saddled up and burdened with packs and supplies, but they don’t bother to search for the owners, they’re surprised to find Bilbo, and they question him as to whether there are more like him about. Trolls are meant to be stupid, but they’re not that stupid. Most of all, the decision to remove the Took/Baggins theme from the film bugged me not only because it makes Bilbo’s presence on the journey inexplicable, makes his character more simplistic and less compelling than in the book, and leads the film to make sloppy, un-Tolkien-like mistakes of the sort described above, but also because it removes the distinctively English charm that pervades the book. The Hobbit is, amongst other things, an extended, but affectionate, jab at a distinctively English attitude, and Bilbo is a distinctively English character. Tolkien begins with a caricature of the uptight parochial English countryman he would have been so familiar with, drops him in the middle of an adventure far bigger than he could imagine, and by the end we have a confident, adventurous, legendary burglar ready to creep into the very lair of a dragon itself. I accidentally rang the bell on the bus at the wrong stop, and instead of explaining my predicament to the driver, got off and walked the rest of the way home. In a way, Bilbo’s journey is one giant walk home from the bus stop. He accidentally invites Gandalf over for tea because he’s trying to end an awkward conversation and it’s the first thing that pops into his head. He then allows an entire troupe of Dwarves into his home and proceeds to feed them and find them places to sleep because he’s too polite to kick them out. He volunteers for a dangerous mission out of a sense that his dignity has been insulted, and then spends a good portion of his journey doing things that nearly get him killed because he doesn’t want to disappoint his compatriots. Eventually, he gets a taste for adventure, and the mask becomes his real face. The transformation from stuffy Baggins to proud Took is what gives The Hobbit its heart, and by removing the Baggins/Took theme in the film, Jackson has made Tolkien’s tale less endearing and less charming than the original. There have been a few articles and discussions on the philosophy blagosphere and Twitter community recently concerning the justification of academia, and of philosophy more specifically. One of the common suggestions that crops up in this discussion whenever it occurs is the idea that philosophy, to put it crudely, helps people think better. In my experience it is typically assumed that this improvement (whatever it amounts to) arises as a result of the training itself—through the constant exposure to criticism, practice analysing the structure and form of arguments, identifying hidden premises, assessing the validity of general forms of reasoning and so on that forms the bread-and-butter of undergraduate philosophy training—rather than a result of knowledge of the subject-matter itself. In fact, it is often claimed that what is distinctive about philosophy is that it has no particular subject-matter, so the forms of reasoning and analysis learned by students—at least at an undergraduate level—will be applicable to any and all fields concerned with arguments and reasoning, from law to business to journalism. I don’t want to touch on whether this is sufficient justification for the existence of philosophy, or whether esoteric academic research even needs to be justified, but I do agree that in some sense studying philosophy makes you a better thinker than you would be otherwise. What exactly this improvement consists in is, no doubt, complex, but I don’t necessarily think that one has to build up practical competence in philosophical argumentation before one can reap the benefits that philosophers offers. An oft-bemoaned aspect of contemporary analytic philosophy is its excessive preoccupation with technical terms and subject-specific jargon. Whilst I think many of the criticisms of this pervasive feature of the discipline are spot-on, I also find (and I imagine I’m not alone in this as a philosopher) that when I think about non-philosophical topics I do so in a way aided by certain philosophical notions—I think about them through and with the aid of philosophical distinctions and terms. When I do, I find that I understand the issues, arguments, or language much more clearly than I would have without the aid of these notions. This doesn’t (yet) amount to being able to assess arguments better or analyse positions in (say) a debate, so in this sense it doesn’t replace the practical competence mentioned above, but it provides a benefit in that, so to speak, the data are clearer than they would be without the aid of such notions, making such assessments easier. I think that this illustrates another way that philosophy can enrich one’s thinking that doesn’t reduce to the practical know-how gained by taking philosophy courses and having to sharpen one’s critical reasoning skills (though I don’t deny that the two are intimately interrelated). In order to try and get a discussion started on this point, I’ll try to illustrate my point by providing some examples of distinctions and technical terms that I think aid clarity of thought. Given my interests and background, most of the examples of distinctions and ideas that I often apply in non-philosophical contexts were typically linguistic or logical in nature, and their relationship to critical thinking should be clear. Suggestions of other examples (for example, there’s only one ethical/political distinction, but I imagine that those more familiar with these areas could provide more), criticisms (either of my examples or of this whole idea itself), and general discussion are encouraged. Modus ponens, modus tollens, and the relationship between the two. The distinction between soundness and validity. The difference between positive and negative liberty. Scope, and the de re/de dicto distinction. I hope that the usefulness of most of these notions is self-evident, but if not I’d be happy to explain and justify my choices. However, as short and non-exhaustive as the list is, I’m not even sure about the worthiness of all of the examples. It’s not clear, for example, whether the distinction between modus ponens and modus tollens adds anything to the reasoning skills that any competent user of language already has (aside, that is, from an extra piece of jargon with which to talk about them). For example, a common form of reasoning, whether explicit or implicit, goes as follows: if I do X then Y; I don’t want Y to happen; therefore, I shouldn’t/won’t do X. E.g. If I go on the roller-coaster then I’ll be sick; I don’t want to be sick; therefore I won’t go on the roller-coaster. Given that people already engage in this sort of reasoning, which is structurally similar to modus tollens (if not technically a case of it), the distinction itself may not add anything to the clarity of thought that most non-philosophers already have. However, as I said, the examples are, as much as anything, a way to get a discussion started, and I’m interested in hearing what people think, so comment away! John Langshaw Austin (1911–1960) was White’s Professor of Moral Philosophy at the University of Oxford. He made a number of contributions in various areas of philosophy, including important work on knowledge, perception, action, freedom, truth, language, and the use of language in speech acts. Distinctions that Austin draws in his work on speech acts—in particular his distinction between locutionary, illocutionary, and perlocutionary acts—have assumed something like canonical status in more recent work. His work on knowledge and perception places him in a broad tradition of “Oxford Realism”, running from Cook Wilson and Harold Arthur Prichard through to J. M. Hinton, M. G. F. Martin, John McDowell, Paul Snowdon, Charles Travis, and Timothy Williamson. His work on truth has played an important role in recent discussions of the extent to which sentence meaning can be accounted for in terms of truth-conditions. Men have always had a place within feminist movements, though exactly what role they have to play within feminism is something of an awkward subject. This awkwardness is not inherent, for (barring perhaps certain forms of radical feminism) there’s no intrinsic incompatibility in the idea of a male feminist—gender equality is something that anybody can strive towards. That being said, feminism isn’t about men, and it shouldn’t be co-opted by men claiming to speak on behalf of women. Thus, there is a need for sensitivity when one considers how men can play an active role in feminist projects without paradoxically telling women how best to achieve their own emancipation. Some men, in both the first and the third wave of feminism, however, have managed to navigate this tricky territory, occupying a less than trivial position in promoting and supporting feminism either ideologically, socially, or politically. [Incidentally, I can’t think of any male second-wave feminists at all! As usual, comments with suggestions are appreciated.] Thus, whilst there are principled reasons for being cautious about the role that men should play in feminism, there are still active roles that men can and have played to help achieve gender equality. However, this is beginning to change. Feminist and queer zines have been a grass-roots outlet for feminist self-expression for a long time, but over the last few years or so projects of this sort have burst out into the mainstream, largely thanks to the rise of social networking. Sites like The Everyday Sexism Project (and its Twitter account), Mansplained, and (one particularly close to my heart, given the subject area) What Is It Like To Be A Woman In Philosophy? are examples of grass-roots projects aimed at giving women a chance to voice their experiences of sexism. These sorts of movements and projects are fantastic for a number of reasons. For one, “if you don’t experience this kind of abuse, it’s difficult to believe it exists (particularly if you’re a man and this just isn’t part of your daily experience)“. These sites give a sense of the sheer pervasiveness of sexism that can’t be achieved by the reports of a single person, which can easily be dismissed as exceptional. Dismissing over 20,000 voices all reporting the same sorts of stories over, and over, and over, and over again is far less plausible. For another, the anonymity of the internet provides a context within which people can share such stories without fear of judgment or repercussion. Aside from the fact that this sort of forum removes the potential for dismissive or mocking reactions, making people more likely to share their experiences, in the case of stories that relate to professional contexts this sort of anonymity is absolutely crucial, for (hopefully) obvious reasons. However, at a more fundamental level, these sorts of projects mark a shift towards a type of feminism that aims to articulate the experience of women without theoretical, ideological, or political mediation of any kind. Whilst men can detail the theoretical reasons in favour of gender equality, or work to promote political and legal equality, one thing men cannot do is explain what it’s like to experience sexism. In this sense, these movements leave no room for men to try to speak on behalf of women, and this is something that every male feminist should be happy about. That being said, if you do consider yourself a male feminist, there are still things that you can do to show solidarity in response to these projects. For example, Hollaback! encourages people to call out acts of street harassment and stand up against sexism of the sort documented in Everyday Sexism. Similarly, on the academic front, there’s the awesome Gendered Conference Campaign, which male philosophers can help to contribute to by refusing invitations to keynote at conferences that have no women speakers. Without a doubt, however, the best thing that male feminists can do in response to these projects is to listen. Quite simply, we don’t know what it’s like to deal with sexism on a daily basis, but these projects provide a window into that experience that wouldn’t otherwise be available to us. Sexism comes in many forms, many of which aren’t obvious if you haven’t been on the receiving end (I know I’ve been guilty of mansplaining on more than a few occasions, and if it hadn’t been pointed out to me I’d probably still be doing it now without even realising). By paying attention to the experience of women, male feminists can combat sexism in the most efficient way possible: by calling it out wherever we see it, including in our own behaviour—whether obvious or subtle. Tagged everyday sexism, feminism, male feminism, mansplained, mansplaining, sexism, what is it like to be a woman in philosophy? A quick diversion from the usual heavy-going philosophy posts. This is one for my Trekkie readers. I couldn’t think of a clever visual quip for this post, so here’s a picture of a combadge instead. 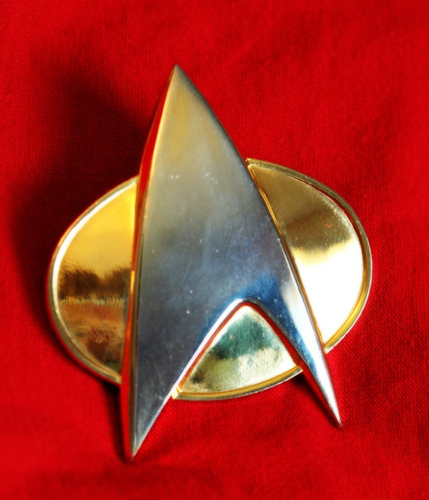 For a while now, something has been bothering me about the combadge on Star Trek. In theory, the combadge can be activated with a single tap and deactivated with a double tap. The problem is that frequently characters will segue into and out of discussions on the combadge at will without tapping the badge itself to start or end conversations. Now this is the future, and we are talking about the Federation. We also know from computer use elsewhere that the parsing and interpretation capabilities of most technology is extremely sophisticated, and that a great deal of the interaction with computers is conducted through verbal commands alone. With this in mind, it seems more than reasonable to assume that combadges analyse the speech of their wearers and execute their commands in much the same fashion, and that a verbal order (e.g. “Captain to engineering”) works just as well as a tap of the badge to get a combadge communication going. But here’s the rub: To perform its task as it does on many occasions, the combadge wouldn’t just have to be capable of perfect semantic analysis, it would have to be practically prescient. One sort of case in particular springs to mind as being particularly blatant and egregious. Transitions out of combadge conversations are genuinely remarkable. Some people (I’m looking at you, Sisko) will simply stop their combadge conversation and immediately move to a face-to-face conversation, without so much as a tap of a badge or a courteous “Captain out”. Even watching the person one’s only clue at first is typically that their gaze will shift from that vacant, listless stare that people get when they use the combadge to instead focusing on the target for the new conversation. 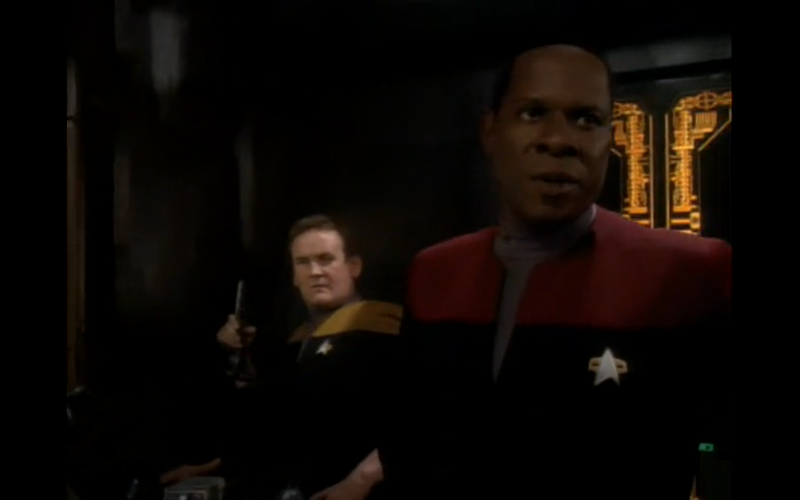 Sisko and O’Brien illustrating neatly the dormant stare brought on by a combadge communication. Even the fastest computer with perfect linguistic understanding couldn’t work out whether the first few words of a sentence are a continuation of the combadge conversation or the beginning of a new, ‘offline’ one. Despite this fact, there are never snippets of conversation accidentally transmitted by the combadge. It somehow miraculously knows when a combadge conversation is over and ceases transmission. Clearly this is just sloppiness on the part of actors/directors, but any suggestions for in-universe resolutions are welcome in the comments. Over the last few posts, I’ve been discussing some philosophical influences of mine, mostly philosophers following in the tradition of Wittgenstein and/or Austin, focusing on the unusually cold reception they’ve received in mainstream contemporary analytic philosophy, and in the last post I tried to detail a few of the barriers I thought needed to be overcome by anyone aiming to successfully integrate these two philosophers into contemporary debates in the philosophy of mind, language, epistemology, and metaphysics. In this final post on the subject I want to explain how it is that I think that the contemporary philosophers I mentioned as influences have managed to do just that. Unearthing and challenging the reasons for the belief that the style of philosophising exemplified by Wittgenstein and Austin has been discredited or refuted in some way. Showing the relevance of the issues dealt with by these philosophers to contemporary debates in the philosophy of mind, language, epistemology, and/or metaphysics. Doing (1.) and (2.) in such a way that the meta-philosophical assumptions underpinning the views of these two philosophers are not domesticated in any way. Whilst these are relatively superficial categories derived from the points touched on in the last post, nonetheless they seem like a good way to structure an exploration of what it means to be a Wittgensteinian Ordinary Language Philosopher almost half a decade after the heyday of both Wittgenstein and Austin. As in the last few posts, I’m going to try to avoid actually doing any philosophy insofar as it’s possible, and instead I’ll try to simply précis the approaches taken by the philosophers mentioned, link to a few relevant papers, and flag any philosophically significant points for future exploration. The philosopher that most naturally springs to mind as an example of meeting the first of these challenges head-on is Avner Baz. In his book When Words Are Called For: A Defence of Ordinary Language Philosophy, Baz makes a case for the relevance of ordinary language philosophy (OLP) to contemporary analytic philosophy, arguing that its premature demise was philosophically unwarranted. Avner Baz: Ordinary Language Philosopher extraordinaire. Baz points out that the most common accusation against OLP’s method is that such appeals to ‘ordinary language’ confuse meaning and use, violating the distinction between semantics and pragmatics. Establishing that we wouldn’t typically use (e.g.) the word ‘real’ in the way that the metaphysician does is a purely pragmatic fact and not one that bears on the truth of their statements. The point can be put, slightly crudely, by saying that whether there are ordinary situations in which we would, as a matter of fact, make the sorts of statements that philosophers are apt to make (“Jones knows that he has two hands”; “numbers really exist”; “you ought to keep promises”) has no bearing on whether their statements are true. Thus, philosophers can pursue the latter question without worrying about the former, since they are only interested in the truth of their claims, not their propriety or impropriety. our words by themselves—irrespective of how, if at all, we are using them on some particular occasion—may express thoughts and thereby carry commitments sufficient for generating and sustaining [genuine problems]. According to OLP, if we produce words without any definite purpose, relying on their meanings alone to ensure the determinacy of what is being said, we will not produce anything assessable in terms of truth or falsity at all (this way of phrasing the point is closer to Travis than Baz in the role it assigns to the meaning of words, but more on that some other time). This is merely a gesture towards the sort of account that Baz puts forward, and one that I hope to elaborate on at a later date, but for the purposes of explaining how he deals with the first of the challenges above, it is enough. The crux of the matter is that one cannot assess the validity of the method of OLP without first assessing the validity of the view of meaning that underlies it. One cannot dismiss the ordinary language method on the grounds of confusing semantics with pragmatics because it is precisely this distinction that the ordinary language philosopher rejects. Arguably one of the biggest challenges is showing how the issues dealt with by Austin and Wittgenstein are relevant to the concerns of modern philosophy. Neither philosopher could have fully anticipated the developments that occurred in Anglo-American philosophy after their deaths, not least of all the explosive revival of metaphysics. As such, it is typically supposed that the problems dealt with by people working on or in the tradition of these philosophers will have little to no bearing on the concerns of contemporary analytic philosophery, as the discipline has simply moved on. I chose this picture because it looks like Travis is really shocked by what I’ve written, and that’s amusing. Though practically any of the philosophers previously mentioned could be cited in connection to this challenge, I’ll focus on Travis as perhaps the clearest illustration. For example, Travis’s collection of essays Occasion Sensitivity is split into two halves. The first explains what occasion sensitivity is and, importantly for present purposes, often explains its connection to Austin and Wittgenstein. The second draws out the consequences of this position for various debates in contemporary philosophy: propositional attitude ascriptions, vagueness, intuitionism, bivalence, identity, and knowledge, to name a few—often pitting Wittgenstein and Austin directly against (more or less) contemporary philosophers such as Williamson, Evans, and Dummett to make the point. a parochially British concern with an outmoded problem, that of overcoming an empiricistic veil-of-ideas scepticism. [See footnote 40 of Tyler Burge’s “Disjunctivism and Perceptual Psychology” for the source of McDowell’s paraphrase, and the explicit link to Austin. Also see Travis’s wonderfully-named “Desperately Seeking Ψ” for a response.] Both McDowell and Travis have, in their own ways, tried to battle against this idea that the concerns of this sort of approach to the philosophy of perception are irrelevant to or superseded by contemporary concerns with representational theories of perception. the points I will make here against the representationalist view differ little, if at all, from points Austin makes in Sense and Sensibilia… a remarkably rich work. Were Austin not so thoroughly ignored, perhaps I would not have written this. By showing in this way, issue-by-issue, the relevance of Austin and Wittgenstein (or of an approach to philosophy heavily indebted to them) to contemporary philosophy, philosophers like Travis are slowly chipping away at the common misconception that the ideas of these philosophers can be safely ignored because they were working on outdated issues irrelevant to modern concerns. The success in meeting the last of the challenges mentioned—refusing to compromise one’s meta-philosophical stance when trying to engage with mainstream contemporary philosophy—is hard to judge, and even harder to convey, since it is tackled differently by each of the philosophers, in a large part due to the fact that they each conceive of the meta-philosophical implications of the work of Austin and/or Wittgenstein differently. However, I’ll briefly mention the approach taken by McDowell, since I think his approach shares a common core with almost all of the philosophers I mentioned. McDowell is fairly explicit about what he takes to be the meta-philosophical stance made compulsory by a commitment to staying faithful to Wittgenstein. He takes the appropriate methodology to be a ‘therapeutic’ approach to philosophical problems, and his meta-philosophical asides are steeped in such terminology. the way to take scepticism seriously is not to try to disprove the sceptical scenarios. We take scepticism seriously by removing the [intellectual] prop [that gives the sceptic’s questions their seeming legitimacy], thereby entitling ourselves to join common sense in refusing to bother with the sceptical scenarios. Wittgenstein is not trying to give an account of norm-governedness as such, for its own sake and independently of any specific difficulty about it… He uncovers a conception that can make… acting on an understanding seem mysterious, and he exposes it as a misconception. That dispels the appearance of mystery, and there is nothing further that philosophy needs to do in this connection… We need to administer what Wittgenstein calls “reminders”… not put forward philosophical theses. Theorizing… would be beside the point. Wittgenstein’s invocations of practice in this context serve not as openings into a theoretical pragmatism, but as reminders for this therapeutic purpose. McDowell tries to follow in his own philosophy this broadly therapeutic meta-philosophical approach. Rather than setting about answering the questions that trouble philosophers directly, as if they were given legitimacy simply by virtue of being posed, McDowell instead tries to identify the specific reasons for which the problem seems pressing. Once he has identified these reasons, he typically attempts to show a way of acknowledging their urgency without thereby engaging in full-scale philosophical theory-construction, often by presenting an alternative that assuages the concerns rather than accepting and trying to address them. This distinguishes McDowell from other philosophers such as, for example, Robert Brandom or Michael Dummett, who can reasonably be said to tackle the second challenge above of showing the relevance of Wittgenstein to contemporary philosophy, but who, in the process, do violence to the meta-philosophical assumptions that underlie the latter’s philosophy by engaging in substantial philosophical theorising. The work of the philosopher consists in assembling reminders for a particular purpose. In one way or another, this dictum is adopted and applied by all the philosophers under discussion, including Austin and Wittgenstein themselves. In this sense, a Wittgensteinian style of ordinary language philosophy is essentially responsive. Rather than assuming that we know what ‘the’ issue with a certain concept is—as if philosophical questions dropped out of the sky fully-formed—these philosophers try to work out why a problem seems to have arisen in this particular context. Then, in their various ways, each tries to unearth and undermine the assumptions that seem to lend the problem its legitimacy. How the assumptions that drive philosophical problems are undermined varies as much as (and in proportion to the extent to which) the personalities of the philosophers vary. Insofar as these philosophers can be described as practicing a form of ordinary language philosophy, the assumptions will be broadly linguistic and the undermining will appeal in some way to typically un-philosophical uses of language (which is one reason to suppose that McDowell satisfies the ‘Wittgensteinian’, but not the ‘ordinary language’ aspect of the appelation, since his approach is not typically focused on undermining the linguistic assumptions that give rise to philosophical problems). By sticking to the dictum in some form or another, however, Cavell, Baz, Conant, McDowell, and Travis all show that there is a way of doing contemporary philosophy that stays faithful to Austin and/or Wittgenstein, making it possible to be a Wittgensteinian ordinary language philosopher even in the 21st century. I’ve been obsessing over a paper and all my free time has gone into writing that. What is that paper? Well, maybe one day I’ll talk about it on here, but I am keen to make it clear that what I write on here is distinct from my actual academic work, so you’ll only hear about it if I ever publish it. Sorry! I get the impression that many academic philosophers use their blog as an online soapbox to get comments on ideas they’ve had, before shaping them for publication. In this sense, blogging functions as an extra route for feedback, in addition to (say) posting draft papers on faculty pages, or the more traditional methods of delivering talks or speaking at conferences. As far as this blog goes, I stand on the side of the Last Positivist in distinguishing my use from such activities. For now, I’d rather stick to the more traditional methods, and make a clear distinction between my genuine academic writing and my online writing, at least until I’m a bit further in my career! This, of course, raises the question, however, of exactly what the purpose of a philosophical blog is if not to disseminate and seek feedback on new ideas. Well, for me at least, one of the primary reasons that I write on this blog is for self-clarification. In keeping with the old adage that you understand an idea best when you’ve had to explain it to someone else, I find that writing this blog crystallises the sometimes nebulous understanding that I have of certain philosophers, ideas, and arguments. In tandem, I hope that this blog can be of help to other people that have struggled with the same issues, perhaps providing a shortcut to understanding that wouldn’t be available if the original text was all that the reader had to rely on. I think this is especially true of some of the philosophers that I have posted about (or plan on writing a post on) whose writing style sometimes makes their ideas slightly opaque on first reading (e.g. Wittgenstein), or those for whom there is relatively little by way of secondary resources to help (e.g. Austin), or both (e.g. Travis). This last point brings me to two other purposes of the blog. As I have made clear in the last few posts, there are many philosophers whose ideas I think are valuable but neglected. Their neglect online is also typically more noticeable than their neglect in publications (as a search for, e.g., Occasion Sensitivity will testify), and I hope that in some small way this blog might help to disseminate these ideas to more people than they might otherwise reach, simply by giving them voice in a place where (theoretically) anybody can listen. Even though I have no doubt that there are many others that could make the points more clearly, more accurately, or more succinctly than I, unless those people decide to start blogging, I’ll keep writing and do the best I can. In the mean time, I hope that at the very least some of these posts might inspire people to pick up a book or read an article that they otherwise would not, and get the ideas straight from the horse’s mouth (or should that be the cow’s mouth?). The second point is that I get the impression that there are also a number of misunderstandings or false impressions surrounding many of the philosophers that I find interesting or worthwhile. Often these false impressions are too indeterminate to be the upshot of a genuine philosophical argument or the expression of genuine disagreement. For example, I think the claim that ordinary language philosophy has been discredited comes under this heading, since many philosophers that would assent to this claim either have a vague idea of what ordinary language philosophy is (typically something about ‘appeals to our ordinary uses of words’), or even vaguer ideas about why it’s discredited (typically something about ‘confusing meaning and use’, ‘conflating semantics and pragmatics’, or ‘committing the speech-act fallacy’). Whilst there are philosophers attempting to make these sorts of false impressions philosophically precise in order to challenge them through philosophical publications, a blog seems like the perfect arena within which to challenge these ideas at the less-than-purely-philosophical level at which they are typically voiced, unearthing the quasi-sociological reasons for their ubiquitousness (see, e.g. “The Strange Death of Ordinary Language Philosophy” for an example)—something which might be out of place in a strictly philosophical publication. Finally, of course, blogs are havens for navel-gazing, and this one is no exception. Whilst I don’t intend this blog to turn into a public journal any time soon, many of the posts will be quasi-autobiographical in nature—if only forming a sort of philosophical autobiography tracking my interests and beliefs as I try to climb the ladder of professional academic philosophy. For more than one reason what I write here will have points of contact with what other people are writing to-day.—If my remarks do not bear a stamp which marks them as mine,—I do not wish to lay any further claim to them as my property. I make them public with doubtful feelings. Perhaps this [blog] will be understood only by someone who has himself already had the thoughts that are expressed in it—or at least similar thoughts… Its purpose would be achieved if it gave pleasure to one person who read and understood it. What Is It Like To Be A Woman In Philosophy?